Probably the most frequently asked question in an orthodontist's office is, "how long will I have to wear braces?" In a society where time is precious, you now have a choice when conventional orthodontics is just too long a process. Utilizing the Periodontally Accelerated Osteogenic Orthodontics (PAOO or Wilckodontics®) protocol, you don't have to be inconvenienced for 2-3 years to obtain the smile that you desire. 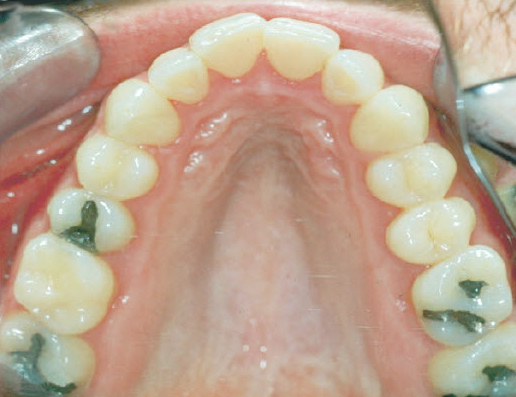 To date, most major advances in orthodontics have been mechanical in nature. These advances increase the efficiency of the application of forces to the teeth. The PAOO procedure exploits the potential of the surrounding bone to respond to these forces. Combining the principals of bone biology involved in periodontal regeneration with those of orthodontic tooth movement, Drs. Thomas and William Wilko developed a protocol that offers outstanding results 3 to 4 times faster than conventional orthodontics. Dr. Wilson has trained with both Drs. Wilko to learn the science and techniques of their protocol in order to implement Wilckodontics® here in the Tampa Bay area. 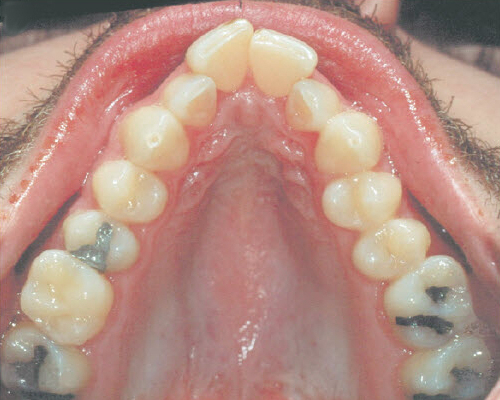 The Wilckodontics® system is feasible for most patients as long as their adult teeth are present. Teenagers or adults with professional or social obligations no longer have to decline needed treatment, this is the treatment they've been looking for! A Wilckodontics® certified orthodontist works with Dr. Wilson to prepare your case for the rapid orthodontic treatment. Typically, your orthodontic appliances will be placed on the teeth and the orthodontist will consult with Dr. Wilson regarding which teeth are being moved and the direction of tooth movements anticipated. This information act as a blueprint for the procedures Dr. Wilson performs at his periodontal office. In most cases, utilizing sedation, a one-time minor type of periodontal plastic surgery is required where the bone is stimulated to allow the rapid movement of the teeth through it and bone graft materials are placed under the gum. Following its stimulation, the jawbone goes through a phase known as osteopenia, where its mineral content is temporarily decreased. While the bone is in this demineralized state, braces can move your teeth very quickly, because the bone is softer and there is less resistance to the forces of the braces. As the bone and bone graft re-mineralize, the bone graft provides extra bone support for the teeth to move into and provides additional stability of the teeth at the conclusion of treatment. This is not the case with conventional orthodontics. 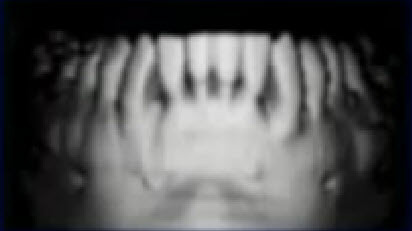 Because the movement of teeth is significantly more rapid than with conventional orthodontic therapy, checkups and adjustments at the orthodontist's office occur approximately every 2 weeks as opposed to the 6-8 weeks between office visits usually suggested with traditional orthodontic treatment. Though the speed of tooth movement motivates many patients to have the PAOO procedure, other benefits appeal to your dental professionals. Because of the bone grafting performed during the procedure, a more stable bony foundation is created for the teeth. For the orthodontist, this allows for tooth movements 2-3 times further than would be possible with conventional orthodontics, confined to and limted by the shape of the jawbones. This can decrease the need for extractions of teeth or for orthognathic (jaw) surgery to correct the relationships of the jaw bones to one another. The increased bony support also creates increased long-term stability as the teeth are not tipped outside the confines of the bone in an effort to line them up for a proper bite or an attractive smile. Having a more solid bony foundation results in significantly less orthodontic relapse and consequently less need for retreatment in the future. For the periodontist, the additional bone support for the teeth results in a decrease in gum recession and, subsequently, decreases the potential for needing gum grafting in the years following orthodontic treatment. 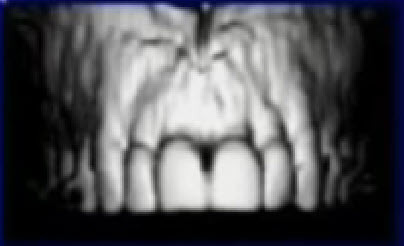 Even when the teeth are moved a substantial distance toaward the outside of the existing jawbone, additional bone can be seen following treatment on pre-and post treatment CAT scans (See Images Below). Notice the prominence of the roots and the sparse amount of bone over the roots before treatment. 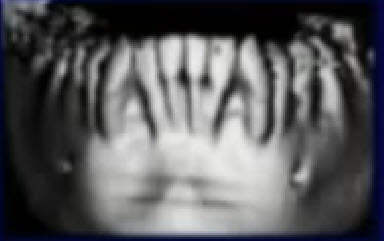 It's very apparent that much more bone is present over the roots following treatment even though these teeth were moved a significant distance towards the outside of the jawbone. The ability to reshape the jawbone during the tooth movement lessens the need for extractions and can provide a patient with a beautiful prominent smile.